Ships within 10 business days. Please allow up to 3 additional week transit time for your item to arrive. 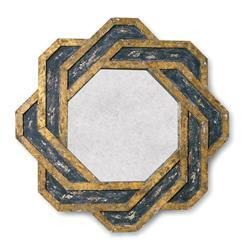 The craftsmanship is immediately evident upon first sight of this dramatic, hand-antiqued geometric chain mirror. Striking charcoal and gold framing intertwines in an infinity chain pattern, showcasing the vintage style mirror held within. Hang this beauty within a rustic or French country style room and it will soon become a focal point, admired by your guests.